Classic monster movies were all the range back in the day. Creatures such as Frankenstein and the mummy, were instrumental in giving nightmares to those brave enough to sit the duration of the movie. Nowadays everything is computer generated, but hey, let’s not forget the classics outright. 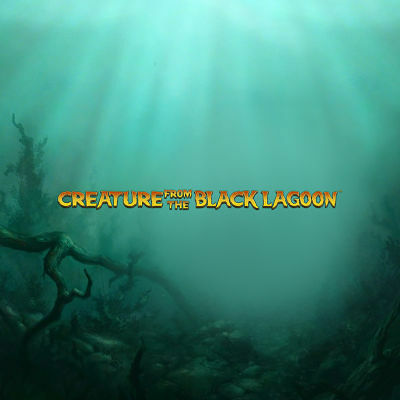 The Creature from the Black Lagoon for example is an example of one of those movies we just mentioned, and also happens to be the main inspiration for this online slot from developers NetEnt. This slot begins with a black and white film of the half-fish, half-human creature rising from the deep in hope of catching you. This is a great opening to this slot and it sets the scene instantaneously. The missing link-like creature will do its best to track you down, its intentions are unknown but what we do know is that keeping your distance to this creature is key in everyday life. However in this slot, players will want to be matching the creature symbol in order to win big. This is a 5 reel by 20 pay-lineslot with many different features at play that will increase scores past their initial ceiling. NetEnt (short for Net Entertainment) are known not only for their highly anticipated online slots and games, but also for their pioneering attitude towards the industry itself. You may know them from cutting edge titles such as Cosmic Fortune and Hansel and Dazzle Me. The original Creature from the Black Lagoon was released all the way back in 1954, however this slot takes a much more modern approach to its graphics and gameplay.Each symbol in this slot is represented by the different scientist characters that can be found in the movie: Kay, David, Carl and Lucas. Each of these symbols offer different numerical based values depending on the symbol itself and the amount of symbols implemented within the winning pay-line. There are wilds and scatter symbols at play here also, and matching them will open up even more chances for big wins should players use them effectively. The highest scoring symbol is, as you’ve guessed, the monster himself. Players will be fully immersed in this slot, there’s no doubt about it. The soundtrack for this slot is very calming, almost like the calm before the inevitable storm. Matching symbols in a winning combination will trigger a different orchestral sound that will permeate through the screen. In some cases a win will also equal a quote from the movie. This again only adds more incentive for players to try out this slot for themselves. Whether you are a fan of the movie or just of a great slot then there is something here for pretty much everyone. Creature from the Black Lagoon takes players into an alternative world where monsters roam the lands in hope of dragging players into the murky waters forever. The shape of water has never rippled so frighteningly. You might want to avoid a few rivers from now on incase of any creatures potentially lurking below. Developers NetEnt have crafted a very memorable experience here so props to them. We can’t wait to see what they come up with next.